Rap-rocker Kid Rock & 80's legends, Foreigner comes to Pavilion at Montage Mountain on Saturday 27th June 2015! 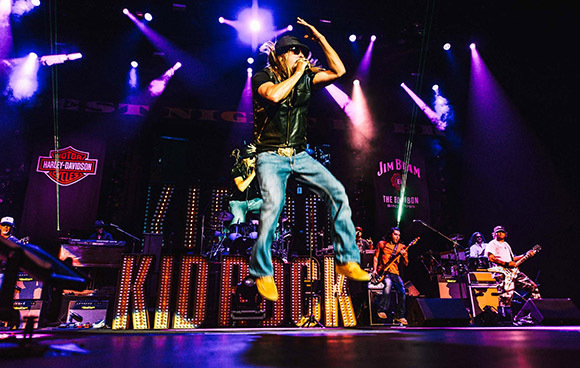 Kid Rock has just recently released his brand new album 'First Kiss' and will be here on his summer 2015 tour! He will be joined by Foreigner, one of the most popular rock acts in the world! Two phoneminal artstis, one night, don't miss out! Kid Rock has had an outstanding career, with his hiphop, rock, rap cross over of genres. He was drawn to the rough edged hip-hop scene in Detroit. And success grew from then on, “I’m going platinum,” he stated before the release of his album '“Devil Without a Cause,” The album has since been certified eleven times platinum. His ever changing, yet distinctive sound has moved towards the rock/country genre. Kid Rock has just released his self-produced 10th studio album, 'First Kiss', which features every side of his distinctive sound. From the Aerosmith-style rocker "Ain't Enough Whiskey" to the modern country ballad "Jesus and Bocephus”. Foreigner are one of the world's best-selling bands of all time with worldwide combination of soft rock and power ballads, they are loved all over the world. With well known singles such as; 'I Want to Know What Love Is', 'Cold as Ice’ or ‘Hotblooded’ topping the US charts amongst others.